When I was 16-years-old, my period stopped. I was an active teen who ate lots of vegetables and looked perfectly normal and healthy from the outside. So, after emphatically reassuring my mother that I was 100% not pregnant, we took a trip to the gynecologist to see what was up. Over the next few months I endured poking, prodding, countless screenings, ultrasounds, blood tests, and a million questions about my body and all of the things I put into it, until eventually I was diagnosed with Polycystic Ovarian Syndrome (PCOS), a reproductive health problem characterized by a hormone imbalance in the ovaries. Although I was never asked by doctors about my physical environment, where I grew up, or what my parents did, I now have strong suspicions that my reproductive health, like that of so many before me, was affected by pesticides that generations of women in my family were exposed to. My mother was a farmworker for over a decade, as was her mother before that. They worked en la uva (grape vines), en el nabo (turnips), y en la cebolla (onion), just to name a few. They spent hours doing backbreaking work in the heat of the Mojave Desert, exposed to scores of pesticides without protection. Agriculture is a major industry in the East Coachella Valley, where our family is from, with about 70,000 acres producing $575 million dollars of crops and agricultural products per year. Keeping those crops healthy and ready for export means dousing them in chemicals like sulfur and atrazine, the latter of which is the most widely used pesticide in the United States. Me in high school around the time I was diagnosed with PCOS. I’m not crazy for harboring suspicions that my reproductive health issues were caused by multi-generational exposure to chemicals used in big agriculture. There is ample evidence to suggest that exposure to pesticides can be traced back up to three generations, and some symptoms can take anywhere from 5 to 30 years to present themselves. “These chemicals can disrupt the proper functioning of hormonal pathways at extremely low levels,” says Nathan Donley, Ph.D., a scientist at the Center for Biological Diversity. “In the case of atrazine, concentrations lower than what is allowed in our drinking water are sufficient to turn a male tadpole into a female frog." And it isn’t just reproductive health that gets affected. Two types of poisoning can result from exposure to pesticides: acute and chronic. Acute poisonings cause symptoms soon after exposure occurs: eye, skin and respiratory irritation, asthma attacks, nausea, vomiting, headache, tremors, numbness and more. 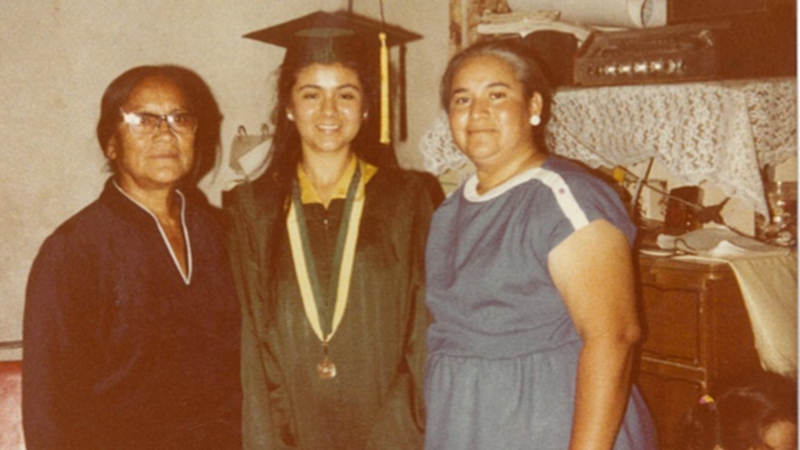 When Doña Enedina was 26, she had her first of two miscarriages. Enedina is now 90-years-old, and an organizer with Lideres Campesinas, a nonprofit in California created by and for farmworker women. Enedina experienced what many farmworkers do—chronic poisoning as a result of pesticide exposure, often at low levels, over a long period of time. Not unlike secondhand cigarette smoke, chronic exposure to pesticide residue and drifting pesticides can have long-term health effects. While it is now illegal to spray a field occupied by workers, no law prevents spraying a field located beside another with workers present. Groups like PANNA have been advocating for protections against pesticide drift— when sprayed pesticides are carried by the wind into populated areas—such as advance notifications systems that would alert residents to when and where pesticides will be used, mandatory buffer zones around locations (such as schools) where pesticides are applied, stronger enforcement of current pesticide regulations, and implementation of farming policies that encourage safer pest and crop management practices. Patsy Montgomery works on legislative campaigns for Planned Parenthood Mar Monte in agricultural Merced County, and is a coalition member of Californians for Pesticide Reform. She says a particular challenge has been the lack of a standard tool to measure pesticide drift in its various forms. Nevertheless, there seems to be little scientific debate that overexposure to pesticides is a far-reaching problem in California, the nation’s largest producer of agriculture. I still have PCOS today, twelve-years later, and I’ve taken the time to learn more about it. PCOS is one of the most common hormonal endocrine disorders in women. It essentially means a woman has multiple cysts on her ovaries and can cause a number of serious health problems, including insulin resistance, type 2 diabetes, high cholesterol, high blood pressure, and heart disease. PCOS is responsible for 70% of infertility issues in women who have trouble ovulating. The doctors told me it was unlikely that I would ever have kids, but lucky for me, they were wrong. Me with my daughter Ximena. I write this as I watch my baby girl sleeping just a few feet away, nestled safely in her crib. I was one of the fortunate ones with an endocrine disorder who was able to conceive and keep a pregnancy to term. But let me tell you, I am scared. Every morning, as I wash the berries that will go with her oatmeal, or the lettuce she likes to gnaw on at lunch time, I am sobered by the toll paid by people like Doña Enedina, or my mom—who herself miscarried twice, five-years after she had stopped working en el campo (the fields). There are bound to be incremental gains—regulations, advances, and campaign wins—but a public health issue of this scale requires a big solution. We need to stand together to fight this. The health of millions of farmworkers in California and the nation, and even future generations to come, depends on it. Learn more about how you can help by going to www.panna.org. Esperanza Mendez is a blogger and community advocate in Coachella, CA.